Unauthorized immigrant populations can rise or fall for a number of reasons. Immigrants may cross the border into a country, decide to leave the country or move from one state to another. Some immigrants die (a small number, because this is a young population as a group). Population totals also can decline when unauthorized immigrants are deported or convert to legal status. Pew Research Center analysis finds that declines in unauthorized immigrants from Mexico played a key role in fueling declines in states where total unauthorized immigrant populations declined from 2009 to 2014. 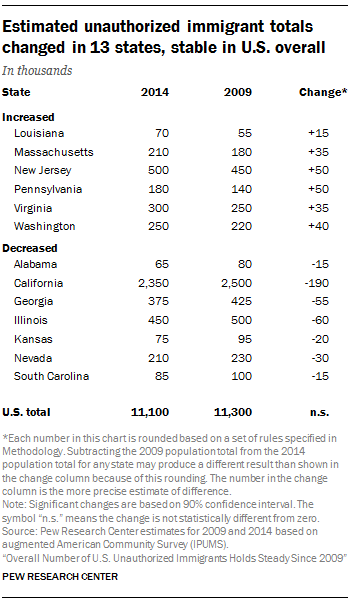 In Alabama, California, Georgia, Illinois, Kansas, Nevada and South Carolina, the overall number of unauthorized immigrants declined from 2009 to 2014, because of declines in unauthorized immigrants from Mexico. The number of unauthorized immigrants from all other countries rose in Alabama during those years, but not as much as the number from Mexico went down. In the other six states where overall numbers decreased, the populations from nations other than Mexico did not change. The overall number of unauthorized immigrants grew in six states from 2009 to 2014. In five of them – Massachusetts, New Jersey, Pennsylvania, Virginia and Washington – the increase was due to rising numbers from nations other than Mexico. In the sixth state with an overall increase – Louisiana – the number of unauthorized immigrants from Mexico grew, while the number from other nations did not change. The decline in unauthorized immigrants from Mexico was widespread, occurring not only in states where unauthorized immigration decreased, but also in the aggregate group of states where it did not. In 37 states and the District of Columbia, there was no statistically significant change in the unauthorized immigrant population from 2009 to 2014 in each state (or the District of Columbia). However, when looked at as a group, the number from Mexico declined and the number from all other countries increased. Mexico is the leading birth country of unauthorized immigrants in at least 38 of the 50 states and District of Columbia. 3 A variety of other countries dominate the unauthorized immigrant population in other states. El Salvador is the leading birth country in the District of Columbia, Maryland and Virginia. The Philippines is the top birth country in Alaska and Hawaii. Other top birth countries include Brazil in Massachusetts, India in New Hampshire and Guatemala in Rhode Island. The size of state unauthorized immigrant populations ranges from less than 5,000 in Maine, Montana, North Dakota, Vermont and West Virginia, to 2.35 million in California. Unauthorized immigrants make up 3.5% of the total U.S. population in 2014. The states with the highest shares of unauthorized immigrants in their populations are Nevada (7% in 2014) and California (6%). But unauthorized immigrants are less than 1% of the total population in Maine, Mississippi, Missouri, Montana, New Hampshire, North Dakota, Ohio, South Dakota, Vermont and West Virginia. Among the 14 states with a median length of residence at or above that for the U.S. overall, eight are in the West. 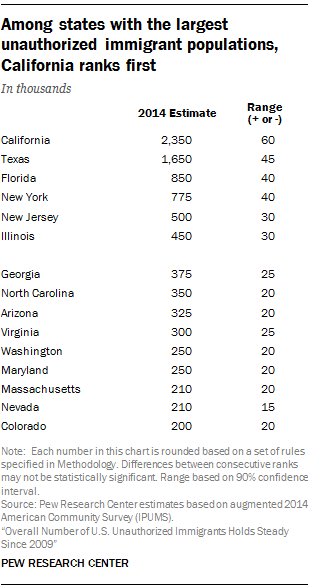 These long-duration states include California, home to the nation’s largest population of unauthorized immigrants, where the median length of U.S. residence is 15.6 years, meaning that at least half of these adults have lived in the U.S. since the late 1990s. Unauthorized immigrants in the West are a more long-duration population than in other regions largely because so many are from Mexico. There is a strong statistical relationship between the proportion of unauthorized immigrants who are Mexican in any given state and the median length of residence of the unauthorized immigrant population in that state. As noted previously, Mexican unauthorized immigrants are more likely to be long-term U.S. residents than those from other parts of the world. Fully 78% have been in the U.S. for a decade or more, compared with 52% of those from other areas. States where populations of unauthorized immigrants have lower median years of residence are more geographically dispersed. 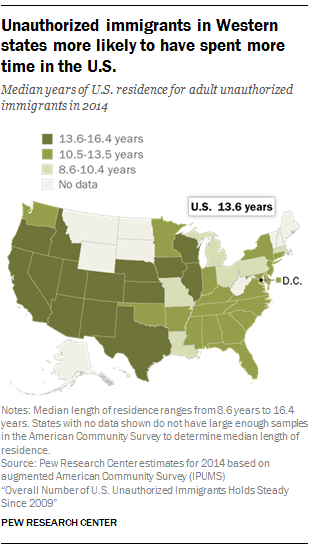 Only five states have a median length of residence that is less than 10 years. They include Ohio (median 9.5 years), Missouri (9.4 years), Massachusetts (9.4 years), Louisiana (9.1 years) and Hawaii (8.6 years).